The basic premise of OiX is disclosure. All you have to do to get your KYC done and we are ready to trade with you. Transfer some cryptocurrency in your account and you can make payment if your KYC is complete. It is as simple as that. You can either instruct us to buy a certain token when the prices hit a certain level or sell your token if prices hits a certain level. We've created the mobile tools you need for trading on the go. Apps will be going live very soon. The most secure hardware wallet out there - secured by your fingerprint - Biometric hardware wallet. Discover the Most secure Hardware Wallet. Governments across the world are formulating regulations for Blockchain tokens but the very nature of ICO, as it currently stands is erroneous. It encourages anonymity and opacity. IPO has certain features like independent audit, financial reporting and due diligence that are absent in an ICO. This is why we have proposed the new standard for going public via a blockchain token offering – Initial Securities Offering. The first premise of ISO is that it considers all tokens to be securities tokens. At this time the ISO standard does not support utilities token in any shape or form. The second premise of ISO is Transparency. Just like in the IPO process, ISO insists on standard disclosure. We are looking at a new era in Blockchain crowdfunding and as soon as the regulations hit us there will be utter chaos in the industry. OiX promises to be the oasis of hope and calm in the chaos. Our focus is on keeping your business future ready. OiX is the new era of trust between the investors, promoters and Governments. OiX is a venture with over 100 years of collective experience just in the core team, working in various spheres at the highest levels. Our vision is to become the next-generation super exchange that drives the ICOs of the future with full compliance and scalability. We are currently operational in three countries and plan to expand our footprint across the globe. Provides deep, liquid pools of capital. Leverages existing investors on the platform. Creates heightened profile, visibility, and credibility. Formalises and conforms the business to similar old-world practices (IPO). Allows founders to retain control. Creates new opportunities and access to new markets. Offers a secondary market for trading tokens. Includes provisions for future changes in regulations. Taps into a diverse and international institutional investor base. We are coming up with our own Cold storage wallet that is independent of any Internet connection and therefore cannot be hacked remotely. 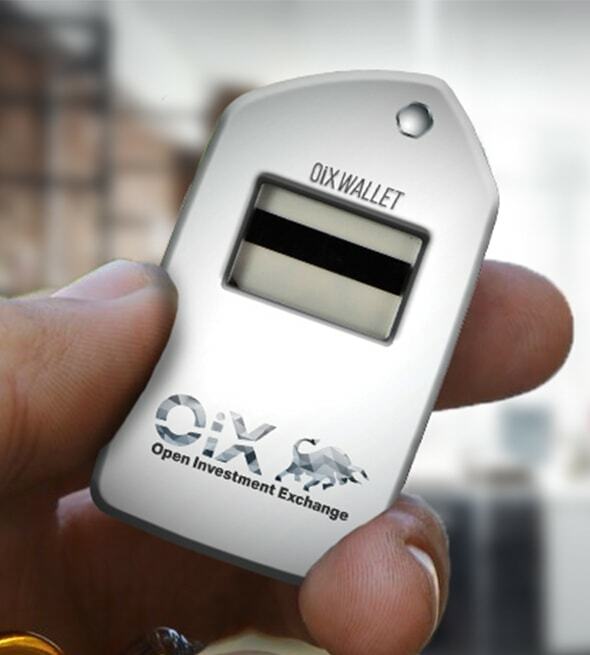 One important feature that OiX Wallet has is Biometrics. This is almost impermeable security that will make your tokens safe. A sturdy design and robust architecture make this a winner.The wallet will be available for bigger investors for no charges and even smaller investors can get it for a nominal price. With biometric security, this will be a product that will give a greater security to the investors.